I have been digg’in on my Furibee x215 so much that I grabbed the x140 when it went on sale at Gearbest. I figured at that price it would have to be really bad to not get my money’s worth and I just needed something bigger than my 90’s to fly over my own house. The idea here is a nice, tight, micro frame strapped with the little bigger 1306 brushless motors on 4s. A clean stacked F3 and 4in1 20A BLHeli-s with a switchable vtx and real ccd fpv camera should give a decent picture rather that the AiO’s on most micro’s. 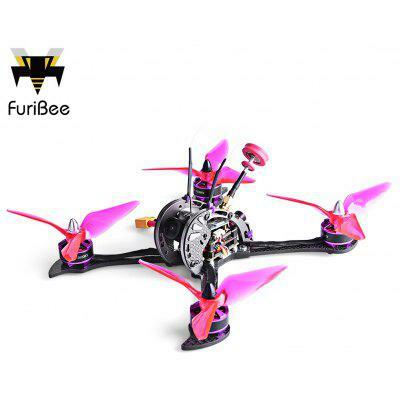 The build quality is very good as we have seen on other Furibee’s. The 4mm 3k frame is pretty strong and takes some abuse. The soldering and all the wires are pretty clean and tight (there was nothing that I noticed on mine that need any touch up). How well does the X140 perform? The x140 is smooth and floaty’ (is that a word) not as fast as I was expecting but still more than enough speed to get you through most acro maneuvers with ease. On 3s its really starving so I didn’t even bother, but a nice high C 4s rips and is hella fun once you have the feel for the x140. I’m big on staying over my property and in my boundaries so this is perfect size for what I was looking for. Obviously I’m a bit partial to Furbiee lately, but regardless this is a solid micro at the price. If you are new the hobby or micros in general then this is a good start as it can really be docile with a lesser battery and leave some room to grow with. Seasoned pilots already building their own wont need it unless your lazy and want something already done. Myself I like it, I may love it after upgrading to some better quality motors. Again I will mention you need a quality battery so figure that in with your total price. We used the Tattu 4s 450mAh 75c and got a good 3 to 3 1/2 minutes of flight time.